AERVOE LED Traffic Flare Kit - Wand-Style (3-Pack) (1158) » Protective Solutions, Inc.
A kit with 3 multi-functional LED Traffic Flares that can be used as a road flare or for traffic control. Strong enough to withstand heavy truck traffic yet light enough to hold easily in your hand to direct traffic. 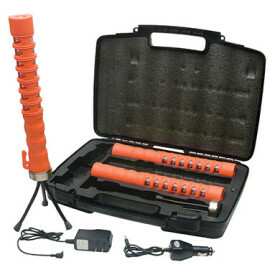 Replaces standard safety wands and incendiary flares and reduces the risk of fires. The kit includes 3-single flares and 2-Flex Fit Tripods inside a durable storage case that doubles as a charging unit with all chargers included. Available in Red or Yellow.